Patient engagement can lead to better health outcomes, but not all engagement strategies are equally effective. Viewing patient engagement as a collaborative effort between the care team and the patient is key to successful recovery for injured workers. Patient engagement is an important aspect of healthcare strategies to achieve the triple aim of improving population health and the patient experience, while also reducing the cost of care. A large collection of studies from around the world have shown that positive patient engagement leads to better health outcomes,1 as well as stark differences in the healthcare experiences of engaged vs non-engaged patients. Interestingly, while there is broad agreement within the healthcare community that patient engagement reaps many benefits, there is much less consensus on precisely how to define it. 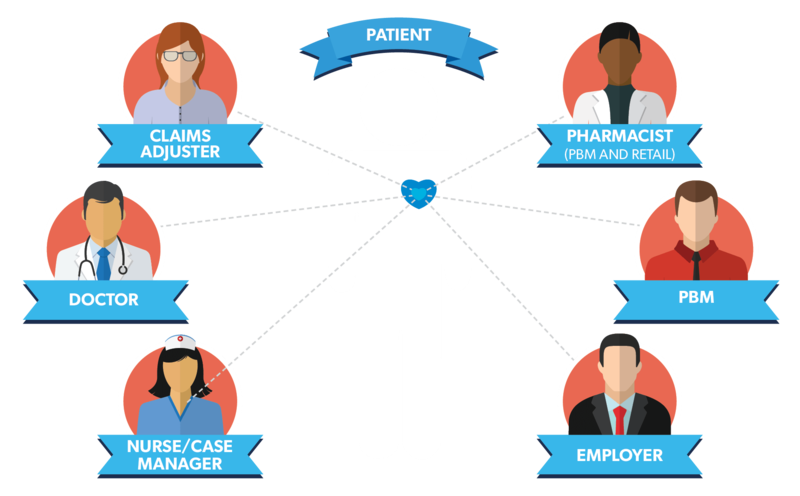 Some confusion stems from similar terms, such as patient experience, which is a broader concept, and patient empowerment or patient activation, both of which are components of patient engagement. Patient engagement is the use of intervention by the care team to increase the patient’r;s positive role in their care. The challenge, of course, lies in how to do this. What methods should providers, payers, and their pharmacy partners employ to engage patients in meaningful ways that produce positive results? Acceptance of these applications will likely grow over time, but it is important to note that technology is only a tool that can be used to facilitate the flow of information between clinicians and patients. More personal approaches to patient engagement naturally take more time, which is an increasingly rare and valuable commodity in healthcare. 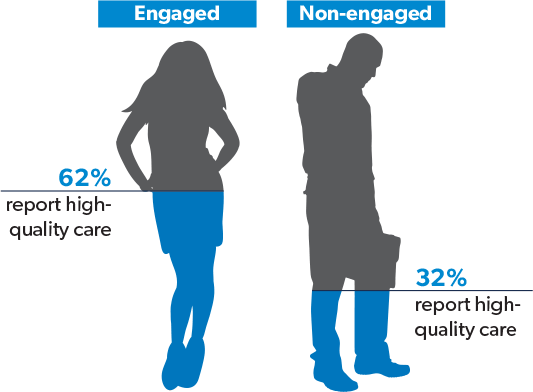 The average visit time between physicians and patients has shrunk to below 15 minutes, 9 and physician assistants and nurse practitioners manage only marginally more time with their patients.10 Consequently, effective patient engagement requires participation from the entire care team, including case managers and clinical staff partners, such as PBM pharmacists. The participants and manner of engagement should be determined by focusing on areas that will reap the greatest benefit to patients. Workers who are injured on the job are always under stress and often in serious pain. Anxiety about potential financial and employment consequences can hinder a worker’r;s ability to focus on treatment and recovery. 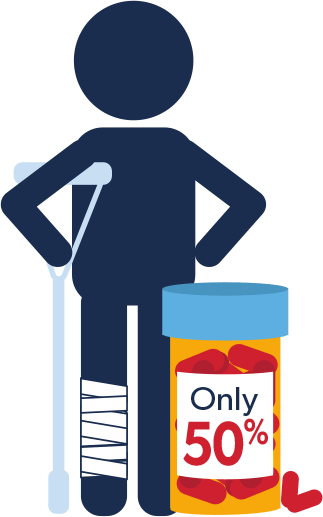 This makes workers’r; comp patients highly likely to be among the 50&percnt; who leave the physician’r;s office not understanding what they were told.11 So, it is especially important that the rest of the care team step in to provide interpretation and guidance about the prescribed treatment regimen. Case managers, claims adjustors, pharmacists and others must be on the lookout for health concerns such as comorbidities, opioid abuse, and medication adherence. In addition to reducing costs, speeding return to work, and improving adherence, patient engagement reaps other benefits that contribute to superior health outcomes for injured workers. Engaging patients, especially through human-to-human interaction, builds trust, which is an important predictor of better health outcomes for workers’r; comp patients.17 Patient health knowledge is enhanced through engagement, which not only contributes to initial healing, but carries over to assist with general wellness. And both patients’r; and care team members’r; satisfaction levels are positively impacted by successful collaboration. An important first step is to stratify patient populations according to health and safety risk factors to identify the patients who will benefit most from higher levels of engagement, as well as the care team members best positioned to help them. For example, patients with comorbidities who face greater risk of adverse drug reactions and/or medication non-adherence due to polypharmacy may benefit most from engagement with pharmacists. Stratifying patient populations allows for more personalized and effective patient engagement strategies. Accounting for differences between patients can be as important in communicating with them as it is in treating them. Health literacy, language fluency, and age are important considerations. Younger patients may prefer to engage via text messages, while older patients respond better to live telephone conversations. And patients of all ages will engage much more actively in their most fluent language. Communications should also be relevant and timely. An annual broad-based message about physician dispensing will not yield the same results as a targeted communication to a patient who recently accepted medications from a physician. As noted earlier, patients often leave the doctor’r;s office not understanding what they have been told and it is a mistake to take for granted that patients have all of the information they need. Every touchpoint along the care continuum is an opportunity to educate and engage. Patients absorb information at different rates and through different mediums, making it important to use a variety of channels including print, online, video, live presentations, and good old one-to-one conversation. Engaged patients who take an active interest in their own care can influence their health outcomes enormously, but they cannot do it alone. Clinical expertise and appropriate guidance from the entire care team is essential. And, while the right technology will facilitate the flow of information and achieve efficiencies, it cannot replace the human interaction required for the most meaningful and effective engagement – care teams and patients working together to improve health. “If you build it, they will come”r; does not apply in patient engagement. Providing resources to patients is helpful, but most are not likely to find and use them on their own. This is especially true in workers’r; comp where patients often believe they are at the mercy of ‘the system.’r; Proactively reaching out to offer information and assistance will go a long way in ensuring appropriate care, improving adherence and, perhaps most important, building trust. This is especially true when outreach comes from clinicians, such as pharmacists and nurses, who are perceived as highly credible and trustworthy by patients. The recovery process for injured workers can be volatile, and clinical oversight and intervention are essential to ensure that patients continue on an optimal path. Because patients typically see physicians at infrequent intervals, ongoing monitoring and counseling from other care team members are important components of patient engagement. For example, medication reviews with PBM pharmacists can engage patients and foster collaboration between care team members. Such reviews often lead to adjustments in medications, which must then be monitored to ensure intended results. Regular and ongoing follow-up with patients about adherence and their response to modifications in the medication regiments is truly meaningful engagement that helps build a trusting relationship while providing crucial clinical information. 1 -Hibberd, J, Greene, J. What the evidence shows about patient activation; better health outcomes and care experiences; fewer data on costs. Health Affairs. https://doi.org/10.1377/hlthaff.2012.1061 Feb 2013. 3 -Patient engagement. People actively involved in their health and health care tend to have better outcomes—and, some evidence suggests, lower costs. Health Policy Brief, Health Affairs, Robert Wood Johnson Foundation. https://www.rwjf.org/content/dam/farm/reports/issue_briefs/2013/rwjf404446 Feb 14, 2013. 4 -Rouse, M. Patient engagement. SearchHealthIT. https://searchhealthit.techtarget.com/definition/patient-engagement 2017. 6 -Fraccaro P, et.al. Patient portal adoption rates: A systematic literature review and meta-analysis. IOS Press. doi: 10.3233/978-1-61499-830-3-79. 2017. 7 -29 statistics you need to know about healthcare & telemedicine. First Stop Health. https://www.fshealth.com/blog/29-statistics-about-telemedicine-healthcare August 1, 2017. 9 -Hasson, J. Older patients, longer visits. AthenaInsight. https://www.athenahealth.com/insight/older-patients-longer-visits June 10, 2016. 14 -Lipton, B, Colon D, Robertson J. Workers’ compensation prescription drug study: 2013 update. National Council on Compensation Insurance (NCCI). https://www.ncci.com/Articles/Documents/II_Prescription_Drugs-2013.pdf Sep 2013. 15 -8 Reasons patients don’t take their medications. American Medical Association. https://wire.ama-assn.org/practice-management/8-reasons-patients-dont-take-their-medications Oct 16, 2015. 16 -Improving engagement of injured employees. Gallagher Bassett. https://www.gallagherbassett.com/media/3268/final-10_20_employeeengagement_rnote.pdf 2016. 17 -Robinson, TA. WCRI identifies trust in the workplace as a key “predictor” of outcomes important to injured workers. LexisNexis. https://www.lexisnexis.com/legalnewsroom/workers-compensation/b/recent-cases-news-trends-developments/posts/wcri-identifies-trust-in-the-workplace-as-a-key-predictor-of-outcomes-important-to-injured-workers July 6, 2014.